The main feature of Swyft Filings is their low price and quick turnaround for business formations. They advertise same day turnaround while other reputable services, such as my recommendation LegalZoom take 3 days minimum. After reading many negative reviews (scroll down for details and excerpts) about delays in processing I think that the company is unrealistic and perhaps promising timing they cannot deliver. Also, LLC formation or incorporation is an important legal process that I do not want rushed, lest mistakes are made. They are one of the newer business formation websites online. They did not disclose the number of business customers they served. LegalZoom has helped over 3 million businesses start with legal services and Incfile has 100,000 customers. 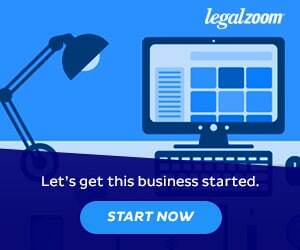 >Read my review of LLC formation at LegalZoom and use promo code BEST4B19 to save $35 or more! Swyft filings were established in 2012, LegalZoom in 2001 and Incfile in 2004. 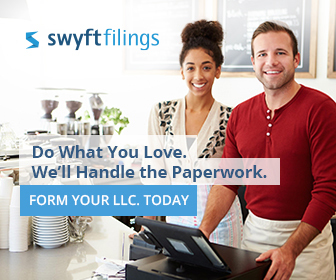 The bonus features, at no extra charge, that each company offers is Swyft Filings gives customers lifetime support to answer your business legal questions about your LLC formation. LegalZoom offers, what to me is of great value, Peace of Mind Review, which is an expert human review of your documents for completeness and correctness. Swyft Filings LLC is NOT accredited by the Better Busines Bureau. I don’t like to see this. After also seeing that they did not claim their Google map listings it highlights some lack of attention to detail. This concerns me when I am considering hiring a company that is going to attend to the details for my LLC formation. The majority of reviews on the BBB website are negative including 11 customer complaints registered. Only 5 of the 11 complaints were resolved to the buyer’s satisfaction. Not all of the reviews were negative there were 5 positive reviews by customers. They cited the “smooth and easy process” and “cheap and fast” features as most appreciated. Rated 2.0 stars out of 5 with 4 reviews posted. Within the last 2 months, most of the reviews were negative and rated 1 star. Complaints included late filings and mistakes. I was concerned when I saw that the company had not claimed their Google My Business listing. Seemed weird and perhaps a bit careless for the firm. Don’t waste your time or money, there only concern about charging you for things they can’t do properly! Hard to get a straight answer if someone answers the phone, save you money there not professional at all!!!! Needed an S-Corp filing. Found this company and paid a reasonable fee to begin the process. Had a hiccup with my address they gave me which delayed my filing, but Tyler and Drew swiftly apologized and even gave me a discount on my mailbox. I love their dashboard system, easy to access documents, and corporation alerts and notices it offers. Rated 4.0 stars from 194 customer reviews rated Great. 74% of customers rated them excellent with only 5% rated as bad. The older reviews, further in the past were more positive than the more recent reviews. There could be some recent issues with the company. Quotes from user reviews. Amber with Swyft filings quickly responded to be my previous negative review. She has assured me that they are here to help me with any of my further needs and that the issues that I previously had were only due to new employees who were not properly trained. She has since held resolve all of my issues. Their direct and prompt contact with their customers is great. I would highly recommend them to a first time small business owner over any other online company !